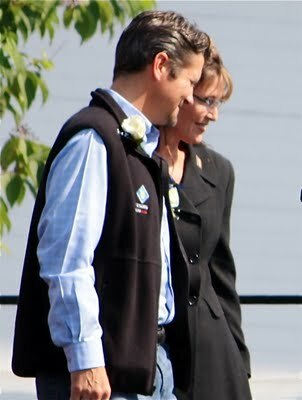 Today Governor Palin and husband Todd celebrate 22 years of marriage. During this time, they have acted as excellent role models for their children and for their communities and now for the nation at large. In concluding her article, Ms. Hutto remarked, “And that statement really sums up the Palins: A couple willing to do what’s right-to walk the walk-no matter how difficult.” That principle has been observed by the Palins in both their personal and professional lives. The Palins celebrate another anniversary today, one that has impacted all of America. For August 29, 2008 was the day that Governor Palin burst onto the national stage as the Republican vice presidential candidate. We at the Sarah Palin Information Blog would like to wish Gov. Palin and Todd a happy wedding anniversary and a happy “Sarah Palin Day” anniversary – as the day she was introduced to America has become known to her supporters. May you have many more happy years together, and may you achieve great success in your quest to restore America to her conservative roots. Today is Senator John McCain’s birthday. And we at the Sarah Palin Information Blog would like to wish him a happy, blessed birthday, with many more to come. We also want to thank him for his many years of service to our country, first in the military and then in our nation’s Capitol. The following overview of that service was shown at the 2008 Republication national convention, where he accepted his nomination as his party’s candidate for President. Here is Video 4 of a series of 9 videos produced by A & E Biography and posted on YouTube by fabiana1233. This video as well as Videos 3 and 5 of the series detail the ordeal that Senator McCain endured for his country. He was offered an easy way out, but he chose to stay the course and honor the code of conduct instilled in him. Senator McCain recently won the Republican primary in his bid for reelection to the Senate from Arizona. Governor Palin endorsed him and campaigned for him and will continue to stand by him as the November mid-term elections approach. We invite our readers to go here and sign Senator McCain’s birthday card. You may leave a personal message if you choose. If you would like to give Senator McCain a birthday gift, you may also make a contribution to his campaign. Happy birthday, Senator McCain! We wish you great success in the November election and in helping get our country back on track! It was his birthday, but he gave us a gift. On August 29, 2008, John McCain managed to give the nation a gift that, unlike most gifts, has grown in value rather than depreciated. I know Senator McCain is a bright man and a polished politician, but I don’t believe he could have guessed the magnitude of his running mate selection. He knew her record, knew her family background, and knew her convictions. But certainly after the election, on November 4, 2008, he couldn’t have known the impact she would have on the face of politics, the power she would wield in her future endorsements, and the lead she would take on issues such as health care, illegal immigration, and the Ground Zero Mosque. He certainly couldn’t have envisioned her standing at the Lincoln Memorial on the anniversary of Dr. King’s “I Have a Dream” speech delivering a speech of her own to a crowd reportedly larger than the one that gathered 47 years prior. 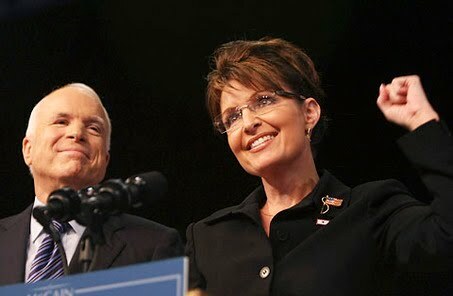 John McCain learned immediately after introducing Governor Palin to the world that the Left wouldn’t play nice, and things were going to get very ugly, but I doubt he knew that the woman he tapped to stand alongside him would not only be able to weather the storms but emerge unscathed, undeterred, and unafraid. I love my country more today than I did before “Sarah Palin Day” launched in Dayton, Ohio two years ago. I appreciate my freedom and those who sacrifice to protect it more than I ever did before that day. And like never before, I am committed to being a voice of common sense and righteousness, rather than embracing silent compliance to an anti-God, anti-American, damaging agenda that some would promote in the name of change. Governor Palin represents a willingness to speak truth despite the cost. She has unveiled and shattered in my mind the lie that it is somehow unthinkable and even unholy to call out others who are doing the unthinkable and the unholy. Many espouse the idea that one must sit idly by and do nothing rather than making some noise and rocking the boat. Not Governor Palin, and not I–not anymore. After losing the election, she could have called it quits and retreated. After murderous miscreants set fire to her church, she could have sat down and said nothing more. After partisan piranhas tried to bankrupt her family and her state, she could have refused to fight back. After heartless hacks shamelessly attacked her children, she could have gathered them up and run to the hills. After the media became increasingly threatened and, therefore, increasingly hateful, she could have become bitter, thrown up her arms, and despaired. And who would have blamed her? The haters’ intent has always been to crush her spirit, but if they have, she has certainly shown no signs of it. Instead, she continues to smile, continues to hope, and perseveres in the hard work it takes to take back America–and she doesn’t seem to be slowing down one bit. While overcoming incredible odds, Governor Palin has managed to be an inspiration to people who had never been inspired previously to get involved. She’s lifted candidates out of anonymity into the forefront. She has battled for the respectful treatment of those with special needs. She has stood in the gap for the most vulnerable of us all–the unborn. She’s been an advocate for those who selflessly serve our country. She has lifted her voice for fiscal sanity, limited government, and protecting our freedoms, our faith, and our Constitution. She has become a symbol for common sense, common decency, and the common man and woman. And most of this has transpired in the last two years. Add to that the impressive resume’ she already possessed prior to August 29, 2008–which is the reason Senator McCain tapped her to be his running mate to begin with–and you’ve got a leader who has brought America to the precipice of something great that we have yet to see in its fullness. I don’t know for sure exactly where Governor Palin has set her future sights, but I feel confident in stating whatever road she chooses to ride, whichever path she opts to occupy, and whenever the time she takes that step, she’ll travel with the right message, a storehouse of support, and, most of all, great content of character. Yes, it was his birthday, but we got the gift. God bless Governor Palin, and God bless America! You can read what I wrote last year on this anniversary here, here, here, and here. Some folks such as Adam Brickley knew Gov. Palin and established websites seeking to have her nominated for the VP slot. For most of us, this moment was the first time we ever heard of her. In my case, I caught her speech on the radio just as it had begun, so I only heard her voice and her words. I did not know her name. I did not know what she looked like or where she came from. I would not find out any of those things for over an hour. There is a certain magic to Guglielmo Marconi’s invention in that it allowed me – the listener – to hear her words and her message without pre-conceived notions associated with looks, or even names. The radio stripped that all away. What I heard had me transfixed within two blocks. I had to pull over to the side of the road. In Gov. Palin’s words, in her voice, in her message, I felt as if I was bearing witness to the resurrection of Ronald Reagan. When I finally did see Gov. Palin’s picture and read her biography in a foreign news site, and pieced together with her Reagan-esque message, I literally fell out of the chair to the floor in my tech support office, gasping “holy (two of the most common expletives)”! “The world shook, the world trembled,” this RNC bio video declared quite truthfully. Her sonic boom certainly rocked my world; she stole my heart, and she divided my calendar. “Sarah may not be six feet tall, but she is a self-made giant.” Today, we celebrate the woman who to her supporters stands 10 feet tall and whose vertical climb is limitless. 06-4122 / AK (cn 4122) Air Force Capt. Jammie Jamieson going into the vertical. 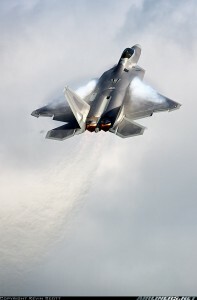 She serves with the 525th Fighter Squadron at Elmendorf Air Force Base in Alaska, and is the first combat-ready woman fighter pilot to qualify to fly the F-22A Raptor. A woman based out of Elmendorf Air Force Base entering a vertical climb: there could not be a better, more providential homage to a little girl who tried to fly. Today Gov. Palin’s sonic booms make the earth shake and tremble. Her biggest one is still yet to come – in 874 days.